Lindsay’s highly interactive, comedic performances delight the young and the young at heart! Her jumbo-sized, hand crafted puppets charm even the most timid audience members and provide lovable characters for thoughtful and memorable short tales. 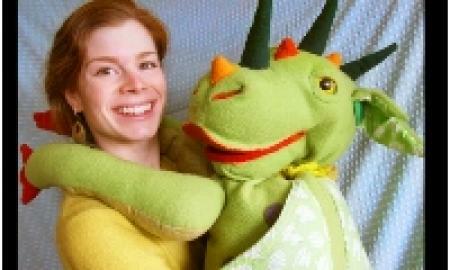 Kids are known to chatter about their favorite crazy puppets for weeks after a show! Thousands of children and families across NH, MA, and ME have enjoyed Lindsay’s professional, high-quality, and high-spirited performances. The program is a great fit for elementary school enrichment programs, libraries, preschools, daycares, museums, festivals, camps, birthday parties and more. Click here for Lindsay's upcoming public events. I have seen Lindsay perform a few times, most recently at our public library. My husband and I enjoyed it just as much as our two children. Her stories are funny and witty; the messages are heart warming and inspirational. My family has seen Lindsay's show twice now at the Portsmouth Farmers' Market, and she is just wonderful - educational, funny, and highly entertaining. Both of my kids (ages 2 and 4) were riveted, as were many other children in the crowd - there were so many eager young spectators, in fact, that Lindsay had to ask everyone to scootch in so as not to block the rest of the farmers' market foot traffic.